These bags are lined with a carbon material in order to “soak up” any smell emanating from the cannabis. Extremely large amounts of potent cannabis will likely still smell, so a providing an extra barrier of smell-proof material or a container is ideal. Should you look at many growers’ personal stash, you’ll find that they often keep their meds in an airtight mason jar. These jars are not only great for pickling, but they’re also pretty good at hiding away smells (until they’re opened, that is!). This is no surprise to anyone who is a bit creative in the kitchen – these jars are used for making pickles, jams and other preserved foodstuffs..
Mason jars are by no means perfect for carrying around your stash. They’re made of glass, obviously, so it’s not necessarily the best thing to have rattling about in the back of your car. They’re also quite big, but you can get smaller ones you can carry around, but again – glass. You can get plastic ones, but they don’t tend to last long. Mason jars also need to be cleaned out every so often in order to retain their odor-stopping powers and to ensure they don’t get moldy. 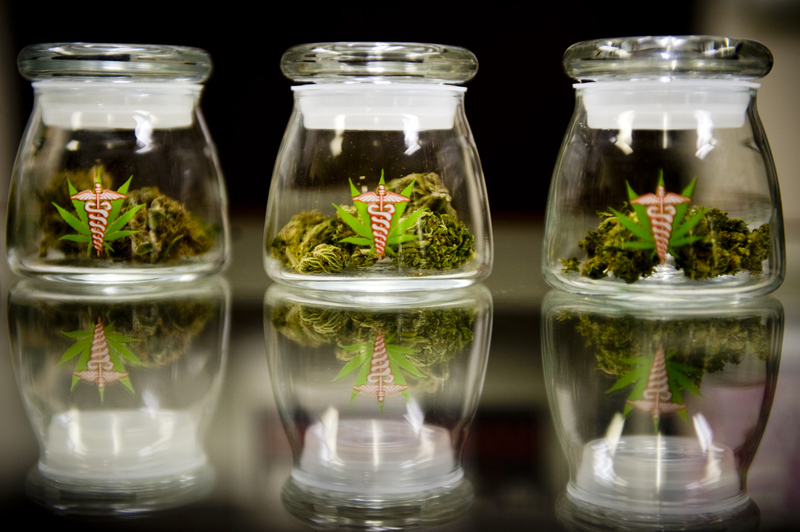 Most dispensaries will hand out small pill bottles with your medical marijuana inside. These pill bottles are airtight, light and small enough to carry around. However, they don’t manage to cover the pungent funk of cannabis completely, and will over time start to smell. For a short-term solution, though, they’re great. There are lots of great smell-proof containers out there on the market today, all targeted towards the discerning, discrete cannabis user. There’s the Tightvac Vacuum jars, Herb Preserve glass, THC Molecule Pop-Top jars and lots, lots more. Which one is best? That we do not know, but we’re sure there’s lots of reviews and the likes online to help you make your decision. The only problem is that the branding can sometimes make it “obvious” what you’re carrying in your specialist jar. Some companies have had the foresight to make containers mimicking canned foods or drinks, toiletries or personal grooming equipment. These can be useful, but again nothing’s perfect. There are smell-proof, reusable pouches out there, like the Echo Pouch. These aren’t 100% odor-proof, and it can depend upon how much you’re carrying in the pouch, but far better than plastic baggies and the like, which tend to make cannabis “sweat”. They’re also light and flexible, so easy to carry around. Also, they’re not necessarily the most discrete things – you can easily feel what’s inside the bag, and the material is see-through when looked at up-close. As for backpacks and holdalls, there are an increasing number of options out there. Sure, you wouldn’t be able to hide the smell of several pounds of uncovered medical marijuana in them, but combined with a good airtight jar, they’ll prove an excellent addition to keeping reek-free. Eastpak make a pretty good, sturdy padded backpack that’s loved by many, and there are companies that specialize in making odor-free backpacks for marijuana lovers. Examples include Vatra, Skunk Travel, Funk Fighter, Stealth and Ultimate Odorless. For those who are fashion conscious check out AnnaBis who make bags that are very much approved. They even offer vegan purses. We hope we’ve given you advice to stay as marijuana stench-free as possible when out and about on your daily travels. However, we do not recommend carrying across state lines, no matter how smell-free you are. Dogs can smell through lots of things (including peanut butter and coffee jars), and bag searches aren’t uncommon at airports and state line checkpoints. Be careful out there, and don’t make yourself another marijuana prisoner! If you are looking to enjoy a weed-cation check out our article below.